Remodeling Easier than you Imagined. 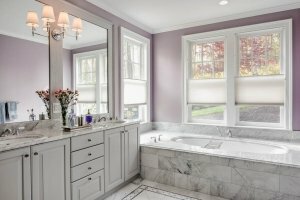 Luxury was the primary goal for this Master Bath renovation. Both homeowners travel frequently for business and wanted to recreate a spa-like hotel experience in their own home. Now that their children are grown, it was time to treat themselves to a modern luxurious bathroom that they love to come home to. 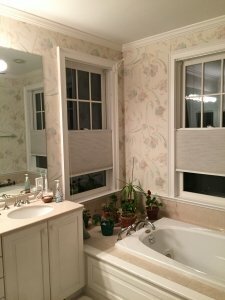 The existing shower was dark, cramped and outdated. As the shower is a prominent feature in the space, we designed a complete shower experience that includes body sprays and overhead rain sprays. Beautiful marble tile is complemented with a dramatic pictured framed focal point detail above the bench seat. 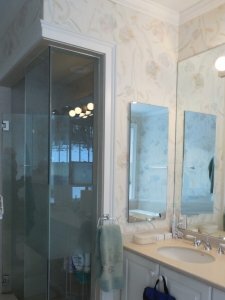 The custom glass door and metal accents are both functional and gorgeous. While the original vanity and jacuzzi tub were incorporated into the new design, virtually everything else in the bathroom was replaced to transform the look and feel of the space. This includes larger items like the shower, countertops and flooring, but also the smaller details like classic glass pulls for the vanity. Custom millwork around the mirrors and other areas of the bathroom add an understated richness and warmth to the space. The new custom marble tub deck around the jacuzzi tub repeats the marble in the shower and is tied together by the marble countertop between the two elements. Less visible, but equally important, their winter mornings will be a little warmer with new radiant heat flooring. Next time we will feature the renovations we made to other areas of the home including the Master Bedroom and the Basement. Stay tuned!